Can you confirm these amateur observations of Lygodactylus tolampyae? Type locality: Forrest near the Eastern coast of Madagascar. Diagnosis Diagnosis. A moderately sized tree-dwelling Lygodactylus, widespread and common in dry forests of western Madagascar. 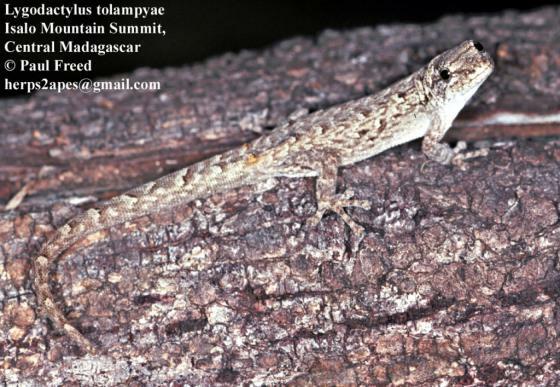 Lygodactylus tolampyae differs from all other Malagasy Lygodactylus by its mental scale that is semi-divided by sutures, with a posterior projection that has a broad and distinct contact to the first infralabial (this contact being absent or less broad in other Lygodactylus). The species is further distinguished from species in the L. madagascariensis group by the semi-divided mental and three postmentals (vs. undivided with two postmentals) and by the presence (vs. absence) of a claw on the first finger; from the species in the L. pictus group by having mostly three postmental scales (vs. usually two) and by lacking yellow ventral coloration in life (vs. presence in L. pictus and L. roavolana); from the species in the L. mirabilis group by granular (vs. keeled or partially keeled) dorsal scales; and from the species in the L. verticillatus group by a non-whorled tail (vs. whorled) and by 7 preanal pores in males (vs. usually 9 or more). Further differences to unclassified species are as follows: L. tolampyae differs from L. ornatus by the absence of dark stripes on the throat (vs. presence) and the number of prenal pores (7 vs. 11); and from L. pauliani apparently by a higher number of dorsal scales along and around the body (for values, see description below). Comment Habitat. Puente et al. (2009) observed specimens belonging to this species active during the day on tree trunks, and at night, sleeping at the end of thin branches of trees and bushes, about 1–2 m above the ground. At Ankarafantsika, Berara, and in the Tsingy de Bemaraha National Park, the species is very common in deciduous dry forest. The species apparently also inhabits rocks in some cases. Etymology not given in original description. BORA, PARFAIT; J. CHRISTIAN RANDRIANANTOANDRO, ROMA RANDRIANAVELONA, ELISOA F. HANTALALAINA, RAPHALI R. ANDRIANTSIMANARILAFY, DANIEL RAKOTONDRAVONY, OLGA R. RAMILIJAONA, MIGUEL VENCES, RICHARD K. B. JENKINS, FRANK GLAW, AND JÖRN KÖHLER 2009. AMPHIBIANS AND REPTILES OF THE TSINGY DE BEMARAHA PLATEAU, WESTERN MADAGASCAR: CHECKLIST, BIOGEOGRAPHY AND CONSERVATION. Herp. Cons. Biol. 5 (1):111-125. Mertens, R. 1965. Über Lygodactylus tuberifer und seinen Lectotypus. Senckenbergiana Biologica 46: 467—469.